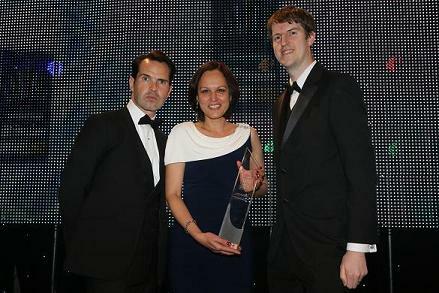 We're thrilled to announce that we won the Corporate Platform / Wrap Provider of the Year award at the UK Pensions Awards 2013. As one of the most prestigious awards in the industry, winning this category highlights our ongoing dedication to providing excellent products and service for our customers. Winners are selected by a panel of industry experts who judge entries on criteria of innovation, performance and service standards. Our Annuities, LGIM and Workplace Savings divisions were all represented at the awards ceremony in the Grosvenor House Hotel hosted by comedian Jimmy Carr. Rosy Anand, Marketing & E-Commerce Director, Workplace Savings commented: "Receiving the Corporate Platform / Wrap Provider of the Year for WorkSave is a fantastic achievement. We've been listening to customer feedback and enhancing our e-servicing proposition, technology and education tools to ensure that WorkSave meets the needs of our customers as they go through the auto enrolment journey. Winning this award highlights the success of this approach and is a credit to the whole team."